Home » Science/Tech » An iPad 2 That Costs $8 Million! An iPad 2 That Costs $8 Million! Why would anyone pay $8 Million for an iPad 2 ? To start with it is an iPad 2 and of course there are some other minor details such as gold, diamonds, dinosaur bones, ammolite(one of the rarest rocks in the world) and a bunch of other boring stuffs. Apple’s iPad line may be the most popular consumer tablets in the world, but for the world’s richest individuals, the iPad 2’s sleek and simple design just doesn’t cut it. 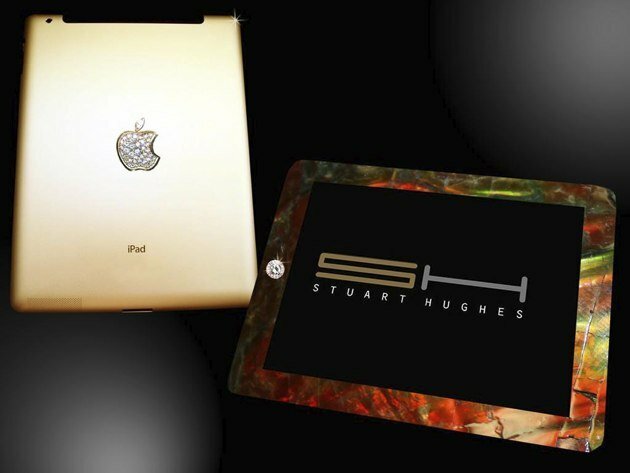 For those folks, luxury afficianado Stuart Hughes is here to help, and his company has created what is undoubtedly the most expensive tablet ever. It’s called the iPad 2 Gold History Edition, and while you won’t likely be able to afford it, the fact that it even exists should be enough to make your jaw drop. To craft the ridiculously expensive tablet, Hughes starts with a 3G-equipped iPad 2. The standard aluminum back panel is then replaced with one formed out of solid 24ct gold, weighing approximately 70 ounces. The default black Apple logo is kicked to the curb in favor of 24ct gold version covered in 53 separate diamonds. Turning attention to the front of the device, the bezel that surrounds the screen is swapped with one made of ammolite, one of the rarest rocks on the planet. Ammolite was made over millions of years from the remains of prehistoric mollusks called ammonites. The Ammolite produces a bright, rainbow-colored sheen that gives the tablet a one-of-a-kind look, but Hughes isn’t done yet. To really set the Gold History Edition apart from other luxury slates, the company takes actual Tyrannosaurus rex thigh bones and shaves them into the finish. To top it all off, the iPad’s iconic home button gets a facelift. The tiny black sphere is replaced with a platinum base studded with 12 outer diamonds and a single 8.5ct centerpiece. The Gold History Edition isn’t the first insanely luxurious gadget that the company has produced, and gilded iPads are available from a number of producers. However, it appears great lengths were taken to make this new offering stand out from the rest of the pack — and it shows in the staggering $8 million price tag. If you’re one of the lucky few who have that kind of cash burning a hole in your bank vault, you better hurry; just two of the lavish tablets are being produced, and they are first-come, first-served. Julian Assange Freed On Bail! Facebook Gobbles Another Start-up, Tagtile! Scientist Claims He Made Artificial Blood! Miley Cyrus & Liam Hemsworth Engaged! NASA was hacked 13 times last year!